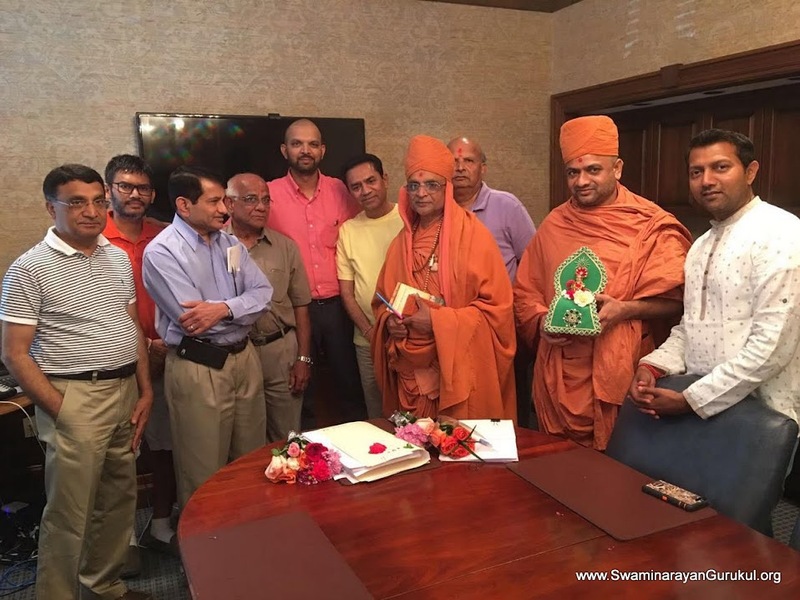 With the blessings of Bhagwan Shree Swaminarayan and Sadguru saints, US based Shree Dharmajivan Trust acquired a 50 acres of land for the educational, spiritual and cultural purposes at SAVANNAH, GEORGIA, with the inspirations and guidance of Sadguruvarya Shastri Shree Madhavpriyadasji Swami. Under the banner of SGVP International Gurukul and in the divine presence of Pujya Swamiji, an event of start-up was held on 09 July, 2016, with the Maha-Pooja of Bhagwan Shree Swaminarayan. Pujya Purani Swami Shree Bhaktiprakashdasji Swami and Pujya Purani Shree Balkrishnadasji Swami also graced this historical event, with telephonic blessings from India. This land consists smashing lake of 20 acres and open land of 30 acres with a newly constructed building of Church. In his inspiring eventual speech, Pujya Swamiji said, ‘”This lush and green campus seems like a very peaceful and blissful spiritual resort. This great attempt came to shape only with the grace of Shree Hari & our great Gurus - Pujya Shastriji Maharaj, Pujya Purani swami, Pujya Jogi Swami and with the selfless support from devotees. Chief Supporter and trusty Dr. Vijay Dhaduk from Pennsylvania, Dr. Jay Harkhani from Salisbury, Dr. Jeram Kankotia, Vijay Solanki from Florida, Manubhai (Jacksonville, Florida), and local devoted Devotees, well-wishes were present at this historical moment.